A few weeks later, Bucklew and four members of the Scouts and Raiders, still a separate unit, also arrived in England and began stealthy reconnaissance operations along the Normandy coast. In what was quickly recognized as a classic breach of the most basic security rules, an admiral thoughtlessly permitted Bucklew and his men to see the plans for Overlord, the code name for the Allied invasion of France. When it was realized that these men would actually be crawling up on the enemy’s beaches months before the invasion and were therefore in serious danger of capture, they were sent to a special school to teach them how to resist interrogation and to escape, if captured. Operating from small rubber boats at night, Bucklew and his men took soundings of the water depth all along the planned invasion beaches. Bucklew even crawled ashore one night and brought back a bucketful of sand so army experts could test it to determine how well it would support tanks and other heavy vehicles as they came ashore. Perhaps more important, Bucklew also studied the nighttime silhouette of the French coast so he would be able to guide the invading force as it approached the Normandy beaches for one of the most crucial battles of the European war. The six graduates of Kauffman’s academy who arrived in England early in November of 1943 made up a Naval Combat Demolition Unit. These units were later enlarged into thirteen-man gap-assault teams. In contrast, the Underwater Demolition Teams being formed in the Pacific were much larger, consisting of about eighty enlisted men and sixteen officers—smaller than, but roughly comparable to, an army infantry company. Those first demolitioneers were among the initial victims of the great secrecy surrounding plans for the invasion. No one knew who they were, what they were supposed to do, or even where they were expected to eat and sleep. 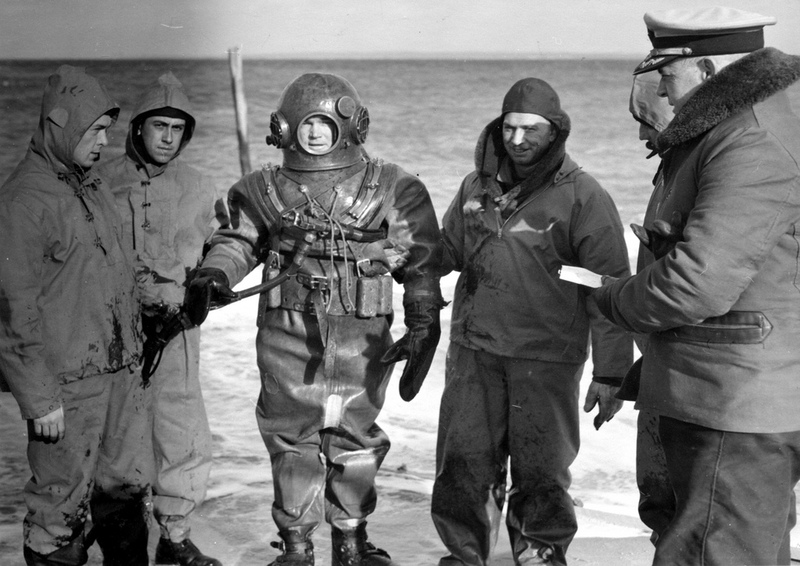 This was in contrast to the situation in the Pacific, where Admiral Turner gave his personal high-level attention to the welfare of the Underwater Demolition Teams. Not until early April, just two months before the Normandy invasion, did the navy men get together with the army engineers to plan the clearance of beach obstacles. And it was well into May before two lieutenant commanders—with no experience in demolition work, but enough rank to gain access to needed intelligence—were sent to England to take command of the units assigned to clear the obstacles at the two American beaches, Omaha and Utah. Field Marshal Rommel himself had visited the potential invasion beaches and sketched out formidable defenses in which steel posts were driven deep into the sand, connected with barbed wire, and reinforced by mortar and machine-gun emplacements. To further strengthen the defenses, the posts were topped by platter-shaped teller mines that would go off on contact. Even more worrisome were the huge metal structures that had been spotted hidden near beaches all along the French coast. These so-called Belgian gates were steel latticework barriers, ten feet square and propped up by heavy steel braces. Although they weighed three tons, they were designed to be manhandled far out onto the sand at low tide to block access to a beach. Word of these formidable defenses worked its way down to the navy demolition teams early enough for them to build their own Belgian gates and then try to destroy them. The trick was not only to blow up the structure but to prevent littering the beach with a tangle of steel that would remain as much a problem as the original obstacle. A young lieutenant named Carl P. Hagensen came up with the solution: a waterproof canvas bag filled with plastic explosive and fitted with a cord at one end and a hook at the other so that it could be quickly attached to an obstacle. Bucklew, who did not like loud noises, was impressed by the practice explosions conducted in a sandy area near Plymouth on the south coast of England. In the States, training usually involved a charge of half a pound, on rare occasions a full pound. In England, the demolition men used twenty-pound charges, enough to “blow that steel for half a mile.” In those tests, the sausage-shaped packages of explosives designed by Hagensen worked perfectly. Attached to the braces of a Belgian gate, they caused the big frontal latticework to fall flat on the beach. By the time of the invasion, ten thousand Hagensen packs were ready for use, and they soon became popular with the Underwater Demolition Teams in the Pacific. In the weeks before the invasion, every available man was flown from Fort Pierce to England, while other sailors were simply drafted into the demolition teams and hastily trained. As the training ended in late May, the men were organized into thirteen-man gap-assault teams, one for each of the eight gaps planned for the beach code-named Utah and one for each of the eight gaps in the two halves of Omaha Beach. Working in tandem with them were twenty-six-man teams of army engineers whose job was to take care of the obstacles above the high-water mark while the navy worked on those closer to the water or actually submerged. Long before dawn on 6 June, Bucklew was in a big landing craft in the van of the armada churning across the channel. About fifteen miles off the French coast, his small boat was launched, and he set off on a now-familiar assignment—to lead the troops to the proper landing zone on Omaha Beach. With his little boat stripped of most of its armament, his gasoline engine pushed him along at about fifteen knots, which meant a run of an hour or a little less. Bucklew had gone only about three miles when war suddenly erupted far down the coast to his right, about ten miles away. The sound of powerful explosions echoed across the choppy seas, and flares lighted up the sky. Bucklew had a terrible feeling that he had missed the time and the place of the landing and that the troops had gone in at the wrong spot on their own. But that was impossible. If he had gone only three of the fifteen miles to the beach, he couldn’t be that far off course. Then he recalled that army Rangers were scheduled to scale a cliff some distance away from the actual site of the landing, and he recognized the sounds of conflict as part of that diversionary operation. Still he did not feel really comfortable that he was heading for the right spot until he saw the steeple of the church at the French town of Vierville, centered behind Omaha Beach. Not only had the steeple been pointed out in intelligence briefings, but Bucklew had seen it himself in his earlier visits to the landing beaches. Everything seemed to be going precisely according to plan. In the hours before the landing, waves of bombers swept over the Nazi defenses, dropping thousands of pounds of explosives. Then navy guns took up the task of paving the way for the landing force. Bucklew watched in awe as the salvos from the battleships, looking like huge balls of fire, passed overhead three at a time. The gap-assault teams approached the beaches in one-hundred-foot-long tank landing craft, each carrying a thirteen-man navy unit, a twenty-six-man army team, two tanks, and a tank fitted with a bulldozer blade. Each landing craft towed behind it a fifty-foot boat filled with explosives and other equipment. Watching the gunfire display, it was easy to believe the assurance many of the men had received that they would find nothing alive on the invasion beaches. The demolition men also had the added comfort, under the plan, of forming the second wave of the assault rather than going in first to take out the obstacles. First would come Sherman tanks that had been fitted with large, waterproof canvas girdles which permitted them to swim ashore. With the tanks would come infantrymen to clean out the few snipers who might survive the ferocious bombardment. Two minutes later, just as the low tide turned, the gap-assault teams would step ashore. They would race the incoming tide up the beach, doing most of their work on sand not yet covered by water. The plan and the reality turned out to be two quite different things. The bomber crews, anxious not to hit the Americans, dropped their bombs slightly inland. Many of the navy shells also passed over the positions commanding the beaches and plowed the French farmland, digging long furrows eight feet deep and ten feet wide. The result was that many of the German guns, carefully positioned and sighted to cover the approaches to the beaches from the most advantageous angles, survived and greeted the approaching landing craft with withering fire. The current along the coast also played havoc with the plan. Many of the gap-assault teams drifted off course and landed in the wrong places, finding themselves the first on the beach rather than following tanks and infantry ashore. Many of the men were killed or wounded before they ever set foot on French soil, either cut down by machine-gun bullets or swallowed up in the blast when their own landing craft were hit by enemy shellfire. A few of the teams were able to work their way among the obstacles, placing their explosives and linking them together with primacord, a thin, explosive-filled cord that served a dual purpose. It carried the fire to the charge, much like the fuze on a firecracker. And it also gave an extra bang, to set off the explosive. Quickly the men ran for shelter, popped off a purple flare to warn of the impending blast, and then set off the explosion. In some cases, the explosions had to be delayed because infantry had taken shelter among the obstacles, too frightened to move on up the beach. The sailors ran among them, urging them to move, and setting fuzes timed to go off in two minutes. The GIs moved. According to plan, the gap-assault teams were to land on Omaha Beach at 6:33 A.M. They had twenty-seven minutes to clear sixteen fifty-foot-wide gaps to permit the bulk of the D-day assault force to come ashore. But by noon, only five of the gaps had been successfully opened, and several of them had been partially blocked again by sunken landing craft and shattered tanks. All through the afternoon, the demolition men followed the retreating tide, fighting to open the remaining gaps. Often, they were handicapped by lack of explosives because of the loss of some of their landing craft. The small mines that the Germans had attached to the obstacles were salvaged to eke out enough explosive power to blast the remaining barriers. At several points, the defenders seemed to hold their fire until a series of obstacles was almost ready to blow. Then they would set it off prematurely with gunfire. In one crew, five men were killed and six more were wounded by such a tactic. By evening, when the tide turned once more, thirteen of the planned sixteen gaps had been cleared and marked, and the Americans had a firm foothold on Hitler’s “Fortress Europa.” But the cost had been hideous. 6 June 1944 is remembered as by far the worst single day in the history of naval special warfare. Of the 175 navy men involved in the assault on Omaha Beach, 31 died and 60 more were wounded, a casualty rate of 52 percent. Twelve miles to the northwest, the remaining gap-assault teams came ashore with the second American landing force on Utah Beach. Here the line of obstacles along the beach was incomplete, a much less formidable gauntlet than that arrayed at Omaha Beach. Within an hour and a half, the demolition men cleared seven hundred yards of beach. Then they waited for the tide to recede and opened up another nine-hundred-yard gap. Four of the sailors were killed and eleven wounded when an 88mm shell fell among them, a much smaller casualty toll than that suffered by their colleagues a few miles away.